Aging gracefully is a thing of the past -- and, for many Americans, so are gray hairs. Roughly 75% of U.S. women color their hair, and trips to the salon don't come cheap. If you're considering dropping your colorist and trying your hand at coloring at home, here are some dos and don'ts to help you stretch your buck while looking good. The average cost of a professional single-process hair-color treatment is about $62. Considering that professionally dyed hair needs to be touched up every six weeks, you can rack up some $500 in salon bills each year. Some people try to save money with at-home color kits, which can cost anywhere from $3.92 to $9.94 at Walmart, depending on the brand. With each home coloring lasting about eight weeks, the annual expense comes to around $50 -- significantly less than the salon alternative. Unfortunately, these savings can come at a price. 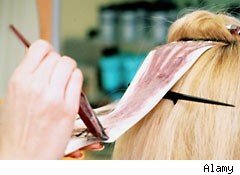 With do-it-yourself hair-color kits, you run the risk of damaging your hair or ending up with the wrong color. "At home, customers apply color from roots to end, but I only do what's needed, and I don't overlap color," says Kacey Welch, colorist at Neil George Salon in Beverly Hills. "A client can damage their hair long term, and corrective color is more expensive." Fxing a bad dye job with a professional corrective color treatment usually costs more than the original single-process color. Welch also points out that you can't always get the perfect color from a box. "I don't pick one color," she says. "I mix multiple colors to make the perfect shade." Jack Miroslaw, owner of Eruan Salon in Manhattan, agrees. "If you want to have good looking hair, you've got to spend the money," he says. So the pros -- unsurprisingly -- advise against at-home color, but Mark Mileti, executive colorist at Minardi Salon in Manhattan, helps his clients stretch the time between their visits by using those kits. "I tell them what to do, on the condition that they'll come back to me," Mileti says. He tells his clients to mix only one-tenth of the dye in an at-home kit and use a Q-tip or toothbrush to apply the color to their roots and part lines. With careful application, these touch-ups can stretch your dye job by one or two weeks, Mileti says.If you decide to take this route, make sure to use a ammonia-free dye like Clairol Natural Instincts. Good Housekeeping and Consumer Reports both named Clairol a top at-home hair-dye brand. You can get the dye at Walmart for $6 to $10 per box. Factoring in the costs of combining salon visits and touch-up kits, you'd spend approximately $420 per year, knocking off the cost of about one salon trip from your yearly expenses. Keep in mind that you'll probably have to use some of that money toward replacing stained towels and cleaning up the mess after your touch-ups. All things considered, there's no real shortcut to great hair color. But with caution and care, you can buy yourself some extra time between salon visits.